October is my favourite month. The heady scent and heat of summer are gone and I enjoyed them, but for me nothing matches the crunch of leaves beneath our feet, the smell of wood being burnt in fireplaces and the fiery burnt umber and violet spectrum colour palette that nature provides in Autumn. The landscape takes on a different countenance, slightly spooky at those twilight hours, morning and evening. The shadowy outline of the trees begins to emerge from under their green leafy mantles, like great sculptures being slowly and tantalizingly unveiled. The seedheads in the garden are spidery forms as they stand bare before Winter brings snow and ice. Animal and bird friends begin to draw close to our cottages, we see more of Mr Fox, Mrs Mouse, Bank Voles and The Thrushes and Blackbirds. Fieldfares and Redwings light up the farm fields. Sometimes in the woods we catch a fleeting glimpse of the Deer. And if we lose ourselves in Autumn dreaming we can imagine that the Wolf is there too, watching us. The village has two Wolves, one black, one white. Both friendly and much loved, but when you meet them in the woods you never know for sure if they are really a dog, or a Wolf after all. I'm sure that they are dreaming too, of long ago ancestors. The village school is on our estate along with the ancient church and small graveyard. Autumn here is splendid in all it's colour. Harvest Festival will see the 12th century church decorated with food and flowers and soon the children will be making Halloween decorations. We always have some wonderful ghosts and witches come trick or treating in the village. I do not see such a pagan festival as being at odds with the Christian celebrations. To me it is different ways to acknowledge and show gratitude at the end of a bountiful time and seek guidance and blessings for the beginning of the more difficult weather to come. Having always loved nature it seems completely natural to appreciate the changes of the seasons and to celebrate what we have received. I think that this is why Thanksgiving works so well in the States bringing together families and friends and giving thanks for the harvest. 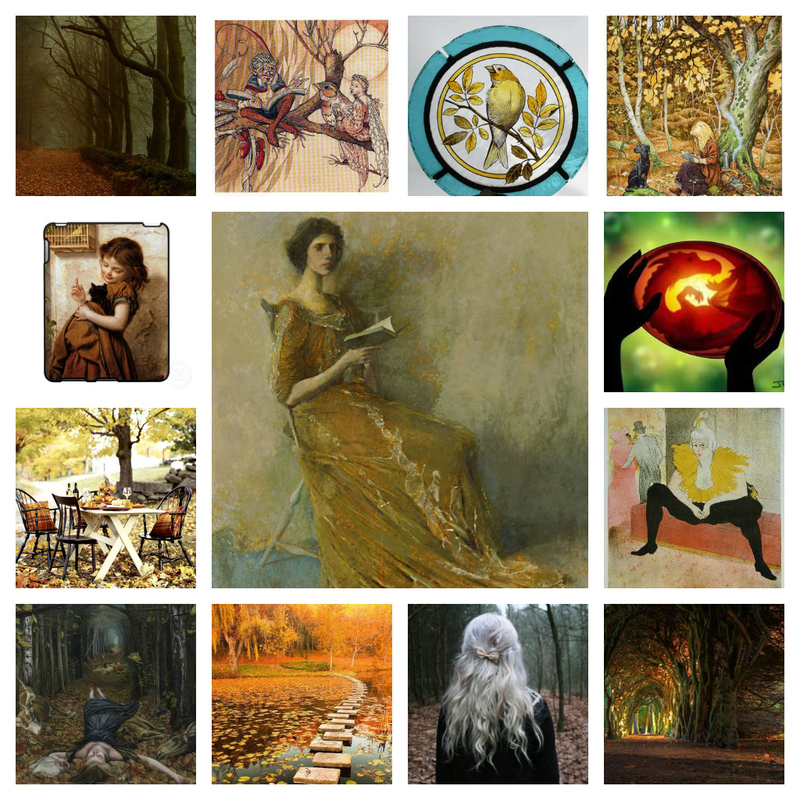 tumblr and pininterest are fabulous resources for ideas and images, but far too often the person who has posted them has not given reference to what they are, or where they came from. Sadly not many of these can be credited as a consequence, but we will continue to look for their sources and when/if found post them here. The little painting of the Fairies in the tree with books and a bird is by Andrew Lang from the Blue Fairy Book. The risque lady wearing yellow, on the right 3 down is by Toulouse Latrec. The lady in the centre resplendant in gold velvet is by Thomas Wilmer Dewing and it is called Portrait in a Brown Dress, (1908) which simply does not do this justice! The charming little girl with the black cat is a vintage print of unknown origin. Lovely pictures and yes it's something special with autumn. What a glorious cavalcade of Autumnal images and ideas you collect together here in this most atmospheric post. Your descriptions of the changing colours in the landscape and of Harvest Festivals are welcome reminders that this is a season to be grateful for the many wonders of the Natural World and the bounty which it provides daily for our needs. The collages of images are wonderfully varied and intriguing. They highlight the many and varied faces of Autumn in its widest interpretation. We have enjoyed looking at them very much indeed. the background picture of Millais is so beautiful, thank you! October is a lovely month, and autumn one of the seasons I like for its scents and its coziness, as you describe it so well. 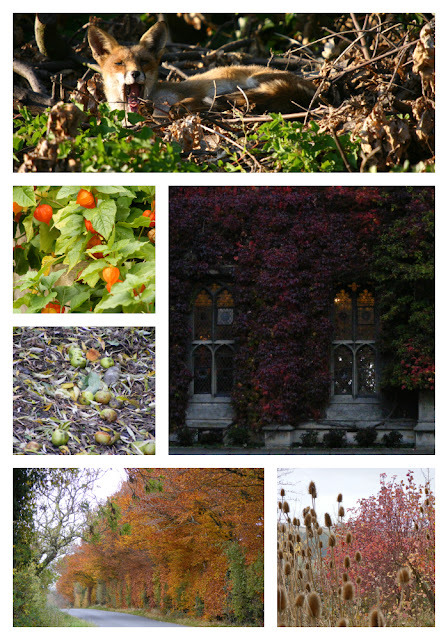 Both 'collages' of your photographs 'Vision of October' are showing us the manifold rich colours autumn has to offer. Your words paint an amazing picture... So much beauty around us in many different forms; if only we find a moment to appreciate it. Many people here in the US count Thanksgiving as a favorite Holiday ~ no presents to exchange, no worries...just good food and family. Makes perfect sense to celebrate our beautiful seasons! Your beautiful autumn words and the images you have chosen are simply gorgeous. Yay i love autumn too, and you have summed it up beautifully......bring it on....in all its beauty and cosy form. I love autumn too! And did you know that the Canadians celebrate their Thanksgiving this Monday? What a beautiful description of autumn in your part of England. You found some great images to accompany your post. Beautiful photos, Mrs. Black! I hope you're having a lovely weekend!